If you say yes to one of those questions, I have good news for you: Confoo is doing another HTML5 training this year. 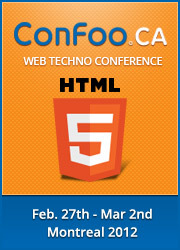 The ConFoo HTML5 training session will be the ideal place to learn about these technologies during two full days. The web converges towards HTML5 for Web application, Website and now, mobile application too. It is critical to know what are the advantages, the actual limitations and the possibilities offered by this technology. The training will be held on February 27-28 at the Hilton Montreal Bonaventure hotel by expert of the industry. Note that the training will be in French, but the trainers understands English. The numbers of seats are limited to 16, so hurry up. For more information and register for the training, go to the Confoo website http://confoo.ca/en/2012/session/html5 . See you there and be ready for an awesome training! It is very nice article.So i like it.